Steve was a friend to all Johnstons, Borderers, Scottish dancers and anyone who enjoyed Scottish culture; always ready with a humorous quip or sagely advice. This true Southern Gentleman could tell you volumes about a single-malt or introduce a Yankee (like me) to the joys of boiled peanuts. He knew more people in the Scottish community around North America than anyone I ever met. Those of us who knew Steve, miss him greatly and will for years to come. 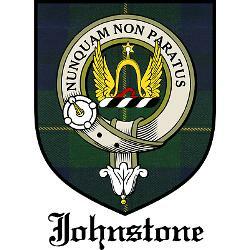 Also see: | Johnstone Clan Merchandise! | Spur and Phoenix Newsletter! Note: The TOUR OF THE BORDERS AND JOHNSTON/E LANDS, SCOTLAND has been cancelled for this year. As tour signups are low, a casualty of the weak economy, the intent is to try again next year to organize a tour of our Johnston/e lands in Scotland. 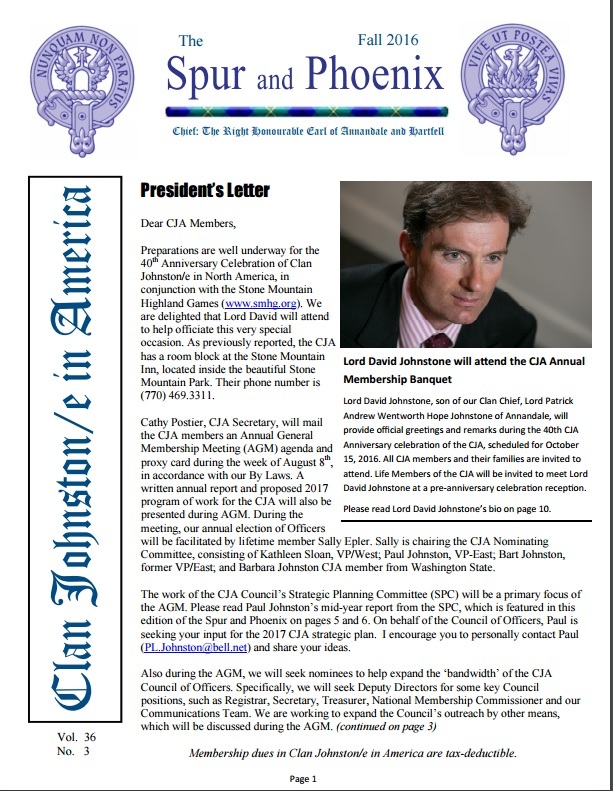 At the 2009 AGM held during the NH Highland Games, CJA dissolved the Lochwood Tower Restoration Project due to the road blocks set forth by Historic Scotland that made the project unreachable and unaffordable. With the help of Lord Annandale and Lord David Johnstone, we came up with a project that is slated to start work 2012 – 2013, called Three Ends Bridge at an estimated cost of 30,000 pds. A vote was taken and passed to transfer the funds of $1,916.50 from the Lochwood Tower Project to the new Three Ends Bridge Project. This is a foot bridge, with three entrances and a gazebo in the center, gives access over the Duff Kinne Waters about three quarter of a mile from Raehills and within its grounds. Originally built as a part of the old Victorian walkways, some of our older members who have visited it, may remember when the gazebo had a thatched roof. Sadly the years and weather have taken its toll and is now in total disrepair. Our first fund raiser will be a raffle of an acrylic painting of the Three Ends Bridge, painted by CJA member Patricia Hovey, who lives in Belmont, NH and donated by myself. We will also be raffling another acrylic painting of Lochwood Castle “in a lightening storm’, painted and donated by Patricia. The photos here, of the paintings, do not do them justice. The Three Ends Bridge painting is from an old photo supplied by Lord Annandale and Lord Johnstone, and shows what it and the area looked like in its heyday. The Lochwood Castle painting was done from the model I built a couple years ago. Paintings are approx. 18”x 24”. Anyone interested in purchasing raffle tickets, please send your checks, (made out to Clan Johnston/e in America) in the amount for the number of tickets you want. Also note which raffle you are interested in, Three Ends Bridge, raffle # 1 or Lochwood Castle, raffle # 2. Tickets are $2.00 each or 6 tickets for $10.00. Lord David Johnstone is offering to place a plaque in the center of the bridge, when completed, with any member’s name who donates $100.00 or more along with those persons would have a 30% reduced rate for a stay the Bothy Holiday Cottage in Scotland. The cottage is just up the river from the bridge and on the Raehills property near the main house. Please submit ticket requests to Arthur Johnston – P.O. Box 71 – Goffstown, NH 03045. We will be selling tickets at some of the Games where we have Tent Hosts. Drawings for the paintings will be held at our AGM 2012. Attendance is not required to win. We are looking forward to your support. Yours aye, Arthur Johnston, Chief Commissioner to Lord Annandale.